Spec Ops: The Line is one of the most memorable shooters of recent years, and so when it came time for a follow-up, the assumption was that Yager Development would go back for more. Instead, it announced Dreadnought, a sort of tactical action game featuring fleets of giant spaceships blasting each other into smithereens. I won't deny that I was disappointed, but after watching the new six-minute Dreadnought gameplay trailer, I'm feeling a bit better about things. 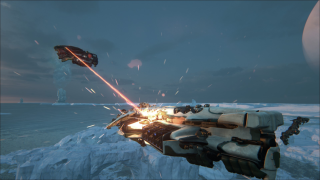 A more detailed look at Dreadnought may be had by way of our hands-on preview from PAX, but the short version is that it's like the great naval battles of old, but with massive spaceships instead of frigates and ironclads. And while it's a bit unfortunate that all the action appears to take place just above a planet's surface rather than in deep space where fleets could really maneuver, the pyrotechnics on display are undeniably spectacular. It also seems to have a meaningful tactical angle to it, with different types and classes of ships taking on specific roles within a fleet. Positioning is very important: Shortly after the third minute, an enemy dreadnought becomes cut off from the rest of its fleet and is brought down in short order. Dreadnought is slated to come out sometime in 2015.